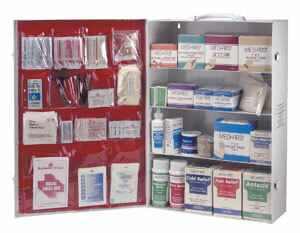 If one of your employees hurt themselves right now, do you have a commercial first aid kit for them to use? Is it fully stocked? It’s not only important to have an OSHA-approved first aid kit onsite, but it’s also important to have the right kind, with the right contents, and have it replenished with first aid kit supplies on a regular basis. Under the ANSI standard, Z308.1-2009, businesses can maintain four different categories of first aid kits for general indoor use, office use and light manufacturing. Kits must also meet the performance and testing requirements set by the standard. Type I: Kits for indoor use, intended to be in a fixed position, not portable, like a mounted wall cabinet for offices or manufacturing facilities. Type II: Portable, indoor kits with a carrying handle to be used in office or manufacturing environments. Type III: Portable kits for mobile indoor/outdoor settings that should have the ability to be mounted and are typical for transportation or construction jobs. Type IV: Portable kits for rugged, environmentally hostile outdoor applications where potential for damage to the kit is high. The ANSI standard details items needed for each kit but they generally include a selection of compresses, bandages, tape, gloves, antiseptic and burn treatments. Businesses with specific workplace hazards should consult with a competent healthcare professional to see what first aid kit supplies they should have. Depending on the workplace conditions, additional supplies may include eyewash, cold packs, eye covers, burn dressings, etc. The standard also addresses requirement marking and labeling of first aid kit supplies and the importance of having the commercial first aid kit regularly maintained, which can be tricky unless you retain a first aid supplier to do it. 2. Accidents Really DO Happen. According to information from the National Institute for Occupational Health and Safety (NIOSH), an estimated 3.8 million workers in private industry and state and local government had a nonfatal occupational accident in 2012. The year prior, an estimated 2.9 million workers went to the ER with an occupational injury or illness and approximately 150,000 of those workers were hospitalized. In the doctor’s office or even a court of law, it’s important for your employee to be able to report that a first aid kit was available and well-stocked, but the injury’s severity required additional medical attention. Undoubtedly, at some time during their tenure with your business, every employee will have interaction with the kit at least once. Really, having a commercial first aid kit there for your employee’s comfort does send a message that workplace safety is important, as is the well-being of each employee. Employees who are more comfortable, are happier and therefore work more efficiently. In some cases, a minor scrape, or headache can send an employee home to get the proper first aid for their ailment. Their departure, even for a short period of time, means others have to take their place, and the domino effect can wreak havoc on productivity. Worse yet, the employee may choose to take the rest of the day off. Having the first aid supplies they need on hand can keep an employee comfortably on the job. When an incident happens, nobody has to run out to the drug store for bandaids; they just reach inside the kit and find everything they need. Again, the first aid kit can keep everyone on the job where they belong and your productivity at the level you require. At Total Fire & Safety, we are experts with OSHA approved first aid kits and have been offering first aid kit supplies and replenishment for more than 20 years. If you have any questions about the type of first aid kit you need for your business, call us today at 630-960-5060.